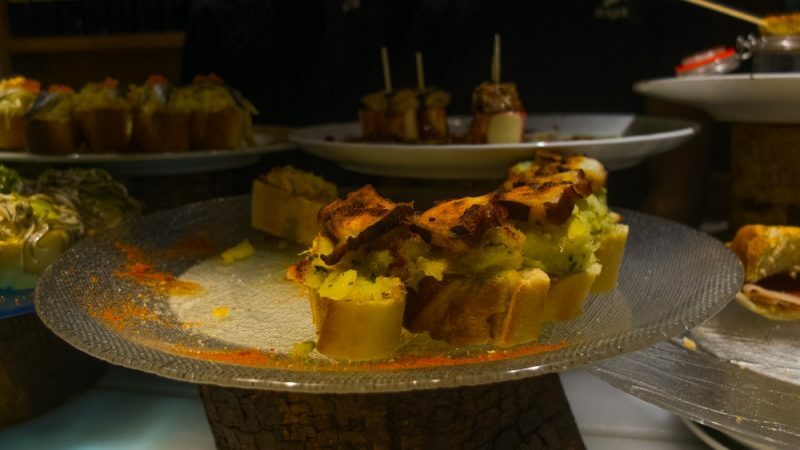 Pintxos (also written as pinchos in Spanish) is the Basque spin on Spanish tapas. 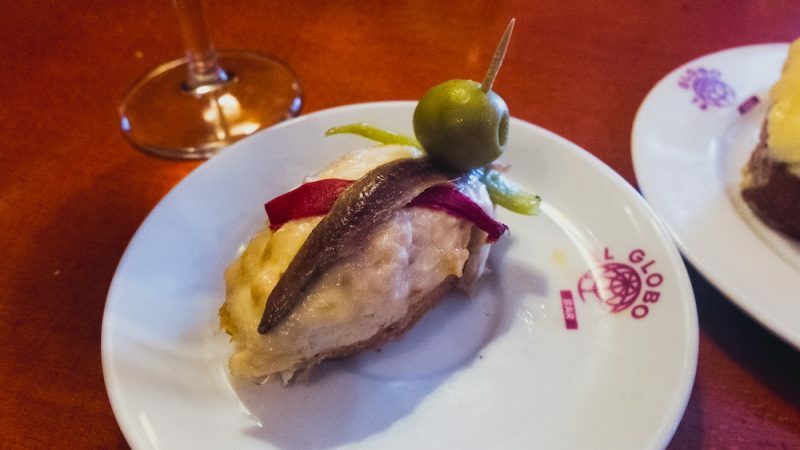 Pintxo literally means “thorn” or “spike” and refers to the toothpick that customarily holds everything together, usually atop a slice of bread. They are the quintessential bar snack and go perfectly with beer, wine, or cider. Txakoli (tx is pronounced like “ch” in Euskara, the Basque language, so it’s prounounced chakoli) is a young white wine with slight effervescence, and one of my favorite things to drink with pintxos. Vino tinto, or red wine, is also quite delicious and usually comes from neighboring La Rioja (the subsection of Rioja Alavesa is actually part of Basque Country). A glass of wine will set you back a maximum of three euros – and likely less than two. 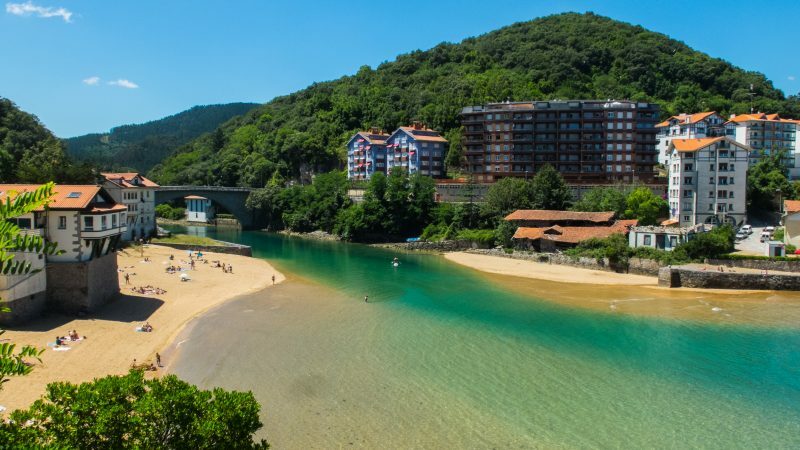 Yes, Spain and the Basque Country are a lush’s dream. It basically works like this: you go up to the bar and tell them what you want. Sometimes they’ll have little signs informing you about what’s inside, sometimes you have to look or ask. They’ll either dish them up for you or, less commonly, just give you a plate for you to take as many as you like. 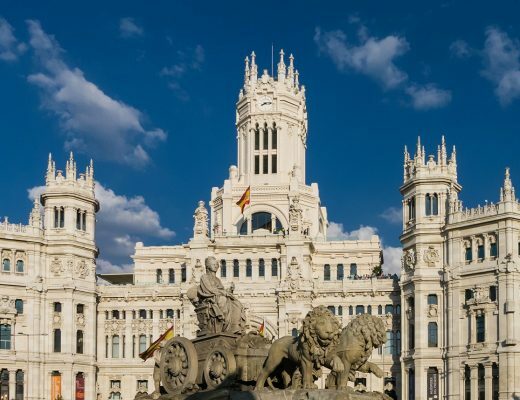 The most common ingredients are the following: bacalao (salt cod), hake (a local white fish similar to cod), anchovies, pate, , slices of goat cheese, hard cheese, fruit compotes or reductions, tuna salad, Iberian ham (jamón iberico), chorizo, morcilla (blood sausage), quail eggs, fresh seasonal vegetables (roasted tomatoes and peppers, eggplant, zucchini), octopus, tortilla española, and so much more. 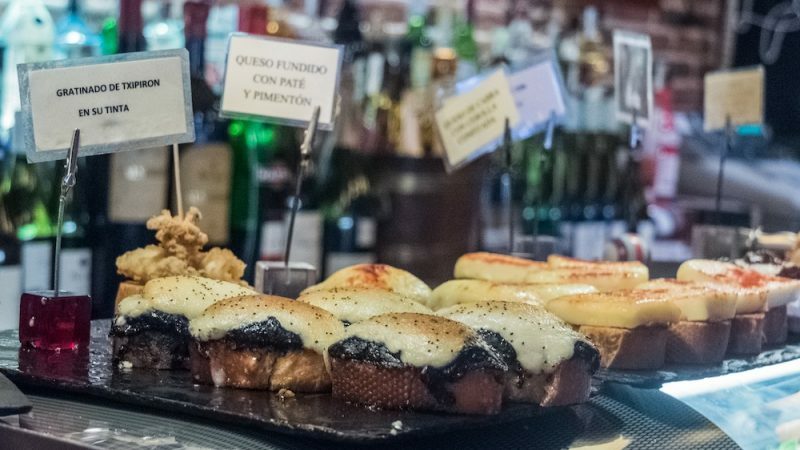 Where the creative culinary soul of the country comes out to play is in how they mix and prepare their ingredients to create unique pintxos at every bar. 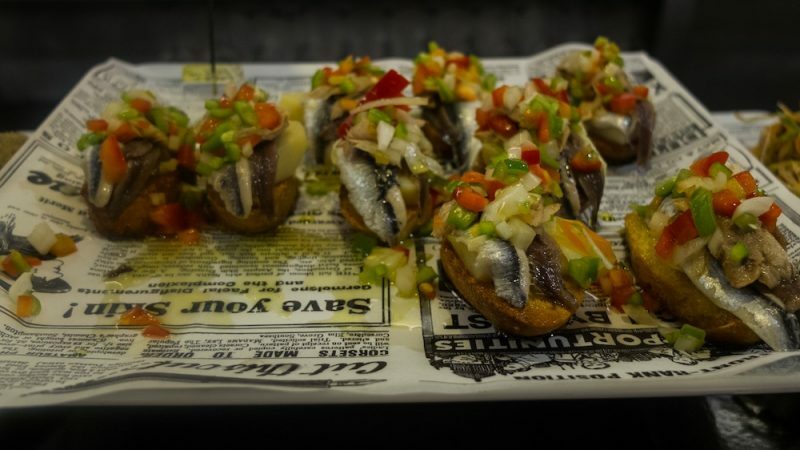 Every single place does their own spin on pintxos. 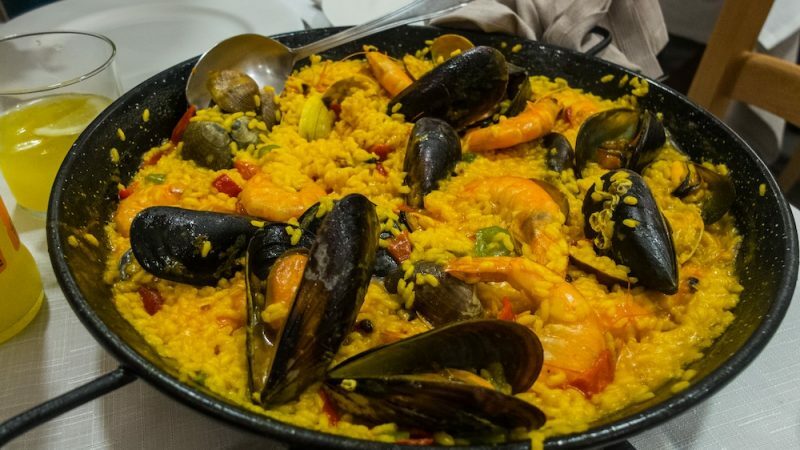 Some are more seafood-focused; others do more creative combinations of meats, cheeses, and accompaniments. Some are more focused on aesthetics; others are bare bones but just as delicious. 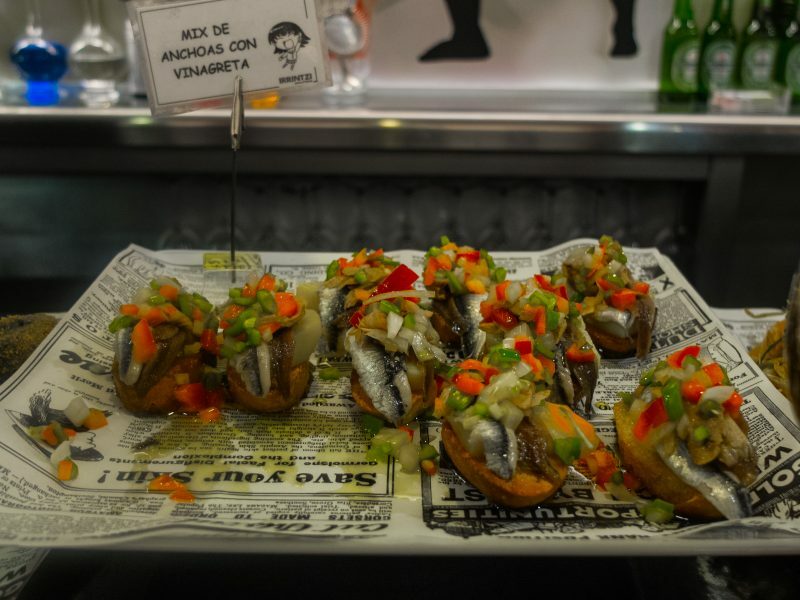 No matter where you go, a pintxo should cost between 1.50 euros and 2.50 euros (usually closer to 2 euros). Some places get very creative with their pintxos. 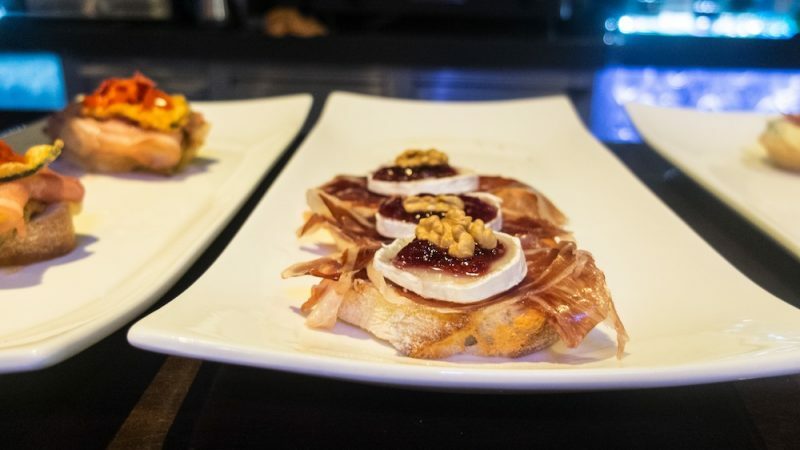 My first introduction to pintxos was actually in Girona, where I ate a delicious truffled goat cheese, candied apricot, and walnut pintxo for a euro ninety — and my life was changed forever. So my time in Basque country became a mix of seeking out gorgeous vistas and gorging myself on delicious pintxos. I based myself in Bilbao for 3 days and San Sebastián for 3. 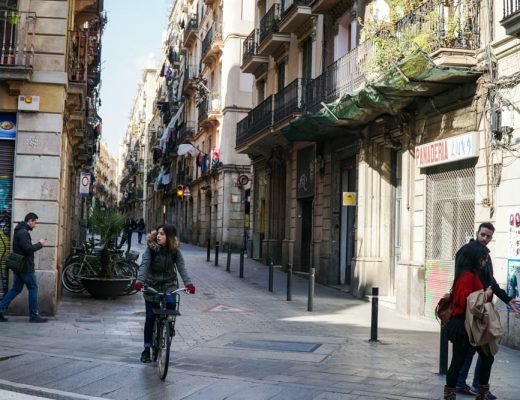 To my great surprise, I far preferred Bilbao, home to the famous Guggenheim museum, and really felt like it was a city I could make myself at home in for far longer. 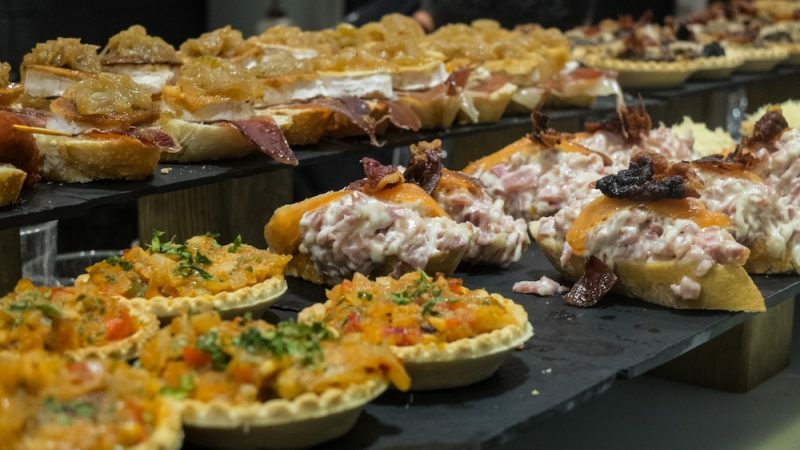 The pintxos scene in Bilbao was very lively in Casco Viejo, and they were some of the best I had in all my time in Basque country. Roasted green and red peppers, toasted goat cheese & fruit compote with a glass of txakoli, only 3.50 euros for the two together. San Sebastián Old Town. Iberian ham, goat cheese, raspberry compote, and walnut. San Sebastián Old Town. Potato and bacalao (salt cod) salad topped with slices of octopus sprinkled with smoked paprika. Casco Viejo, Bilbao. If you’re an anchovy person like me, you’ll be obsessed with their fresh anchovies. This was served with finely chopped pickled bell peppers and tons of olive oil and it was everything. Casco Viejo, Bilbao. 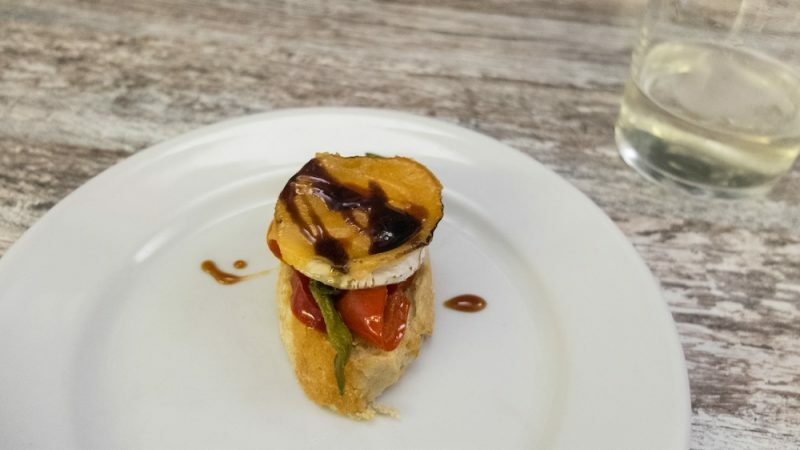 Not all pintxos come on bread! 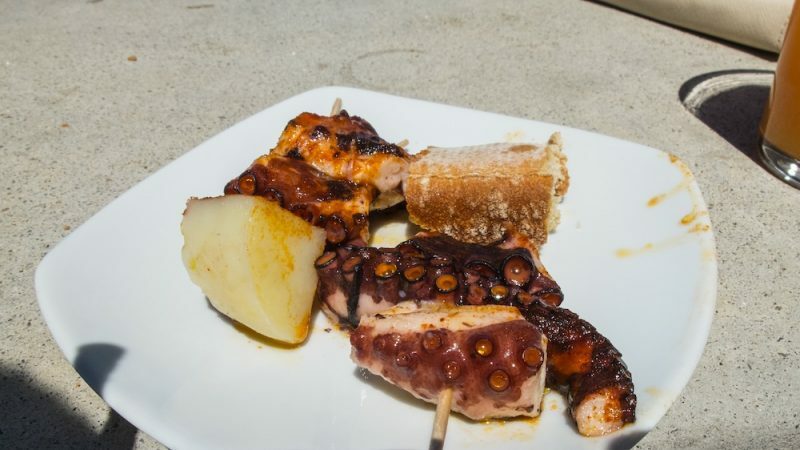 These skewers of tender octopus and potato with smoked paprika were sold just off the beach in Leikeitio, between Bilbao and San Sebastián. 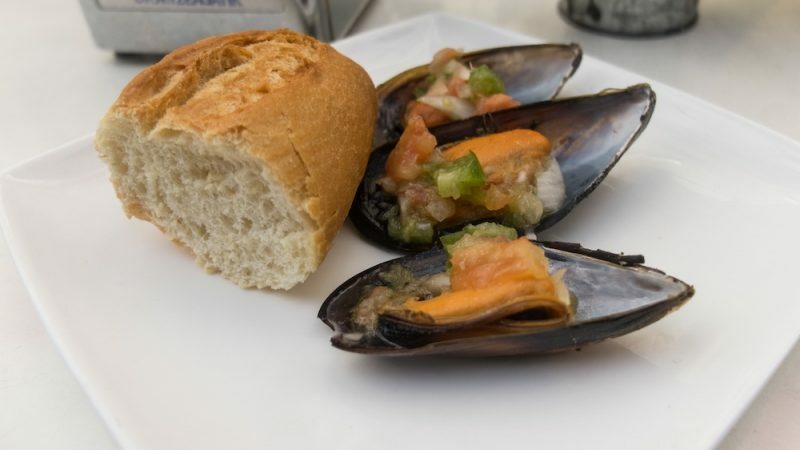 I also had the most amazing mussels of my life in a little town called Elorrio in the Basque countryside. And when you’re feeling overwhelmed by yet another array of indecipherable pintxos…. Not pintxo’d out? 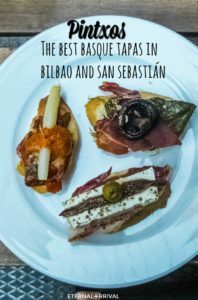 Check out this pintxos guide to San Sebastián!